Screamer's Pizzeria now has a location in Crown Heights. The restaurant, which also operates in Greenpoint, specialize in vegan pizza. Look for pies like the Green Scream with red sauce, fresh spinach, cremini & oyster mushrooms, garlic and vegan cheese, or the Hawaiian Pie with vegan ham, pineapple, tomato sauce, vegan cheese and scallions. 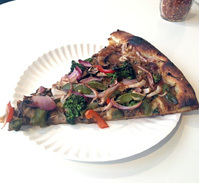 We tried the Veggie Teriyaki which had a nice crispy crust, lots of fresh veggies with a sweet & spicy sauce. The signature "Screamer" pie gets vegan cheese, mushrooms, and almond parmesan. Screamer's offers a large selection of pizzas, including one topped tater tots. The restaurant sits on a sunny corner on Franklin Avenue.